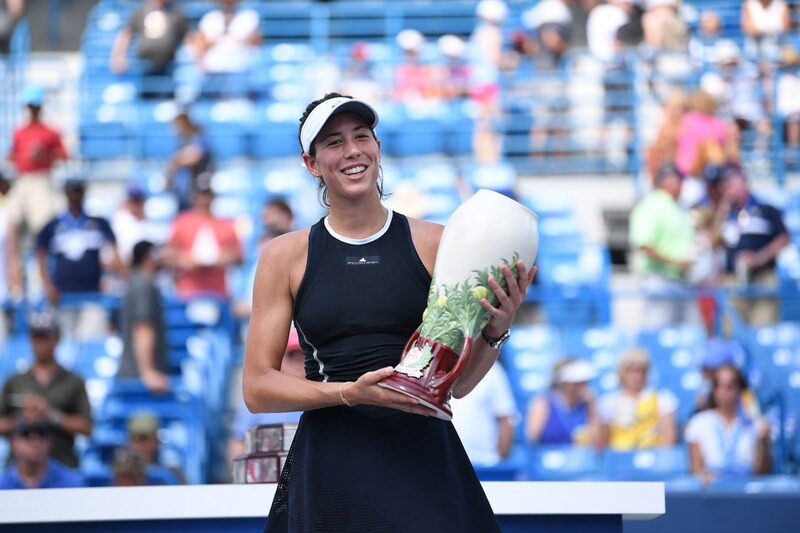 Garbine Muguruza was crowned the Western & Southern Open’s new women’s singles champion Sunday after routing Simona Halep 6-1, 6-0 in the title match at the Lindner Family Tennis Center in Mason. The fourth-seeded Spaniard dropped her racquet, smiled and waved to fans after wrapping up the victory in just 56 minutes. It was a significant achievement for the two-time Grand Slam champion. Not only was the W&S Open Muguruza’s first tournament on American soil, but she collected a $522,450 purse and 900 WTA ranking points. She also denied Halep a career-first spot at No. 1 in the WTA rankings. Halep, seeded second, could have wrested the top spot from Karolina Pliskova with a victory. But, for the third time in her career, Halep fell short; she had No. 1 near misses at the French Open and Wimbledon as well. The Romanian instead departed with $260,970 and 585 ranking points, finishing as a W&S Open runner-up for the second time since 2015. “It’s tough to analyze anymore about this thing. Maybe I feel the pressure and I don’t realize it. Maybe I just played bad. I don’t know what to say. But…I still have a chance. So I will work for it, and maybe one day it will be there,” Halep said. World No. 2 Halep had not dropped a set all tournament before surrendering two straight to Muguruza. She spent less time on the court this week – two hours and 20 minutes, to be exact – but World No. 6 Muguruza appeared fresher and sharper in the championship. She surged to a first-set win against Halep in just 23 minutes. Muguruza set the tone with an early break punctuated by Halep’s return struggles. The Spaniard rolled on, capitalizing on two unforced errors and delivering two aces en route to a 3-0 lead. While Muguruza picked her spots well and collected five winners in the first 15 minutes, Halep looked considerably less crisp. The Romanian held serve in her second service game – her only hold of the match – but Muguruza remained unfazed, quickly returning the favor. Halep requested her coach, Daren Cahill, after Muguruza jumped ahead 4-1. She won an extended rally on the next point but couldn’t maintain the momentum, twice double-faulting as Muguruza went up a double break. Muguruza’s power strokes proved too much for Halep in the first set, and the latter player’s wild return capped the first set and served as her eighth unforced error. Halep fans cheered forcefully when her service game faltered in the second set. She fell behind love-30 and was broken again soon after. Halep appeared frustrated, tipping back her head and looking skyward, after a long return that played into Muguruza’s fourth break of the day. The match featured a hint of drama when Halep faced two break point opportunities. But her forehand return was short on the first attempt and Muguruza’s drop shot foiled the second chance. “I felt there was a key game in the second set, the 3-0 game, but I felt very comfortable there, playing against Simona, and also my level was very high. So I felt like especially in the second set I could raise it a little bit more and close the match,” Muguruza said. After another break, Muguruza did just that. NEW MEN’S CHAMP: Grigor Dimitrov secured his place in Western & Southern Open history Sunday afternoon by winning his maiden singles title in Mason. It was the biggest championship of his young career. By defeating World No. 23 Nick Kyrgios in a 6-3, 7-5 championship, 11th-ranked Dimitrov earned his first Masters 1000 tournament title. “I’m just happy. There’s nothing else I can say, honestly. I’m just happy and I’m humbled to have that trophy in my hands, and especially to win here, my first Masters 1000. It’s just amazing,” Dimitrov said. The 20-somethings made for a unique W&S Open final, as Sunday marked the first men’s title match since 2006 without a Top 10 player. The championship also featured two first-time Masters 1000 finalists, a tour-first since 2002. Seventh-seeded Dimitrov denied his opponent’s bid to be the lowest-ranked W&S Open champ since 1975 (No. 49 Tom Gorman). In all, Dimitrov amassed wins over Feliciano Lopez, Juan Martin del Potro, Yuichi Sugita, John Isner and Kyrgios, and he did not drop a set all week. The 26-year-old’s reward included the Rookwood Cup, $954,225 in prize winnings and 1,000 ranking points. Unseeded Kyrgios, 22, claimed $467,880 and 600 ranking points. Long rallies and crafty returns dominated the first four games as both players held serve. Kyrgios had a chance to break Dimitrov in the fifth game but failed to win an extended rally. Dimitrov broke Kyrgios soon after, dumping the ball into the net and falling behind 4-2. Kyrgios repeated the miscue on his second break point opportunity. While he amassed 11 unforced errors in the 34-minute first set, Kyrgios retained a strong service game that gave Dimitrov problems. “I think the first set was very important, for sure. I thought he served pretty well. I think that was getting him out of trouble pretty much every single time, and I knew – I mean, I knew I had to find a way just to get a few balls back and when it was very important,” Dimitrov said. Kyrgios erased two break points in the second set and issued an ace that helped him hold serve for a 4-3 advantage. The players extended the set to 5-5. Then Kyrgios double-faulted three times in one game. Dimitrov broke Kyrgios and served out the match. Kyrgios hoped the final would be different, but he was not disappointed with his week in Mason. “Looking back from where I was a couple weeks ago, I would have never thought I would have had my first 1000 event final,” Kyrgios said. DOUBLES FINAL: Fifth-seeded Pierre Hugues-Herbert and Nicolas Mahut defeated third-seeded Jamie Murray and Bruno Soares 7-6 (6), 6-4 to claim the men’s doubles championship. The duo won their third Masters 1000 title of the year, and second straight including Montreal, while improving to 6-1 all-time in Masters 1000 finals.